The Council of Indian Nations (CIN) is for Southwest reservation communities where the needs are extreme. Often, these communities lack reasonable access to food, stores, water, transportation, and medical facilities. These are the communities and the needs that most Americans never see. First and foremost, CIN programming fights hunger among Elders. CIN respectfully helps Elders meet basic nutritional needs. The threat of hunger is a constant among the elderly on Navajo, Hopi, Zuni, Apache, and other reservations. CIN services respond to this problem by helping reservation programs improve the quality of food served to Elders in their community centers. This ensures that the Elders eat at least one nutritious meal a day. Staples such as beans, rice, soup, flour, and canned goods are provided to the community centers. 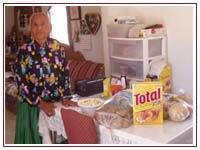 Elders can eat at the center, and healthy meals are delivered to the Elders in outlying areas. The community centers act as Program Partners for CIN services. The Partners, their cooks, and their drivers all volunteer to cook and serve these meals, make the home deliveries, and clean up afterwards. They do this five days a week. This is in keeping with our emphasis on self-sufficiency. Program Partners also determine other kinds of needs in the community that are in keeping with CIN services.